A group of similar things has much more impact than one thing standing alone. 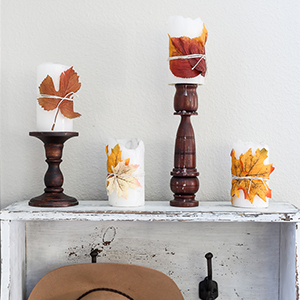 I’ve been slowly but surely bringing fall into the house for my annual week long series: Eclectically Fall Home Tours and it starts next week! We have such an amazing lineup of homes – you do not want to miss it! 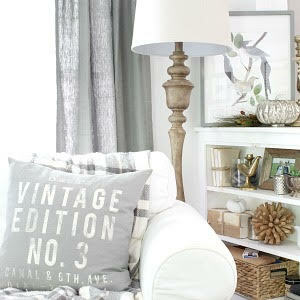 Stay tuned for more quick and easy 10 Minute Decorating Ideas from my friends at the end of this post. I’m kicking fall off with a simple fall dough bowl centerpiece. 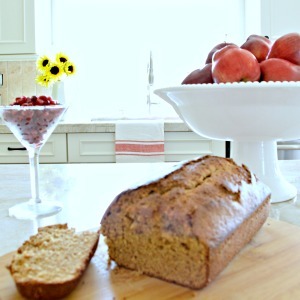 Start with your favorite bowl or tray – I love using my antique dough bowl. 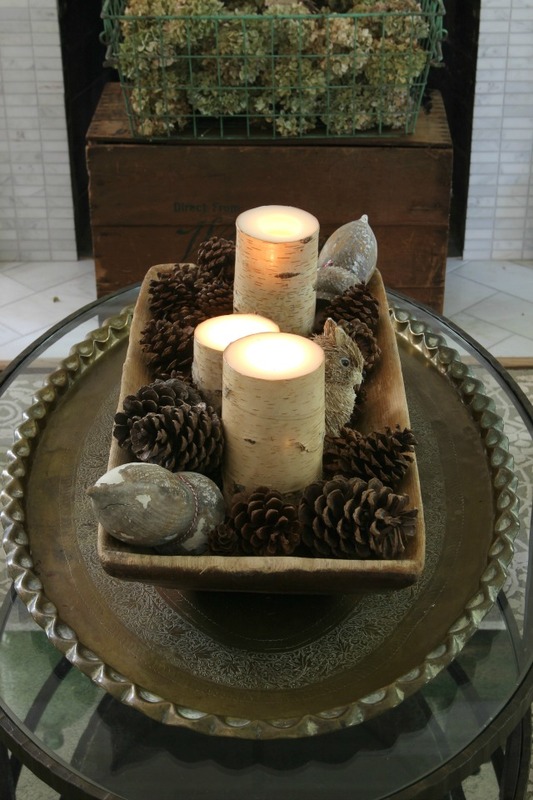 Next, things that need to sit flat – like these birch bark candles. 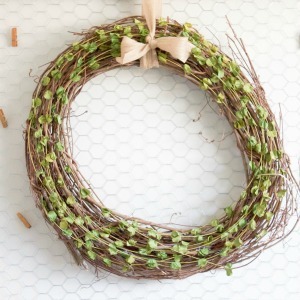 Then add a cute little critter and surround everything with pinecones. I love including unexpected things like this pair of antique water downspouts (hung pointy side down, their shape helped rain drip slowly from them). The candles create such a warm glow – the perfect ambiance for enjoying a glass of wine. 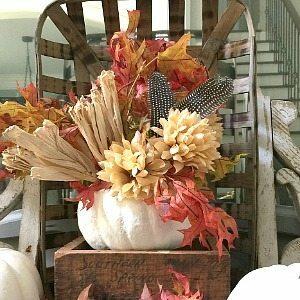 So gather your supplies and turn a bowl into a festive fall centerpiece! « Previous: Changes – New Name, New Look! Thanks for letting me know Colleen – I’m trying to fix it! Sorry Mary – I’m trying to get that fixed asap! Problem fixed – pics are in the post Mary! Me too, just have little x’s in box in upper left corners. Doggone it, want to see your gorgeous centerpiece. Hope you can get it fixed. Always enjoy your posts. The pictures are working now! Sorry for the problem! Will have to see what can find for squirrel, maybe HL. If not have a cute little blue squirrel planter, who cares if it’s blue? Have had little planter for many years, cherish it. Thanks for letting me know photos are working, and they are. 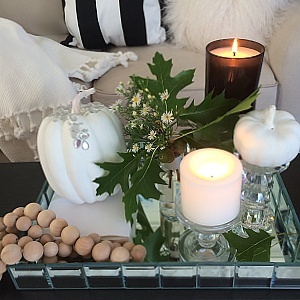 I love that dough bowl and your centerpiece is perfect Fall decoration. 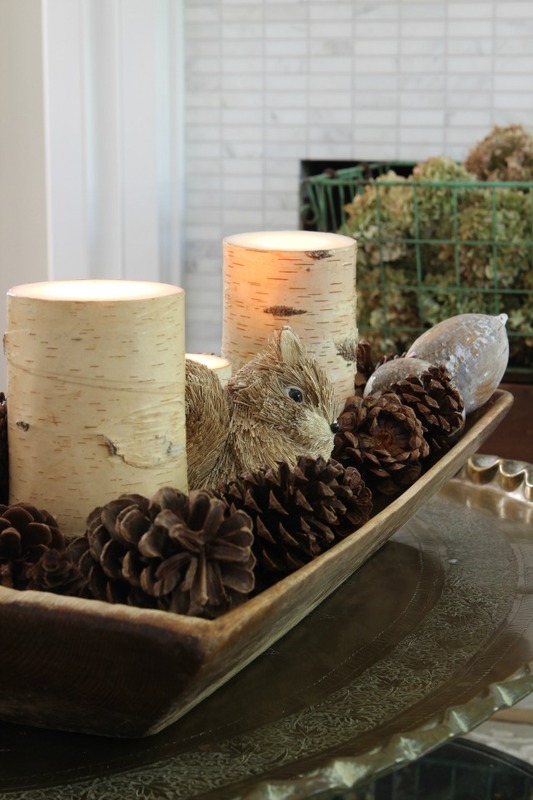 That little bunny critter is adorable and them birch candles; very fitting for your centerpiece. 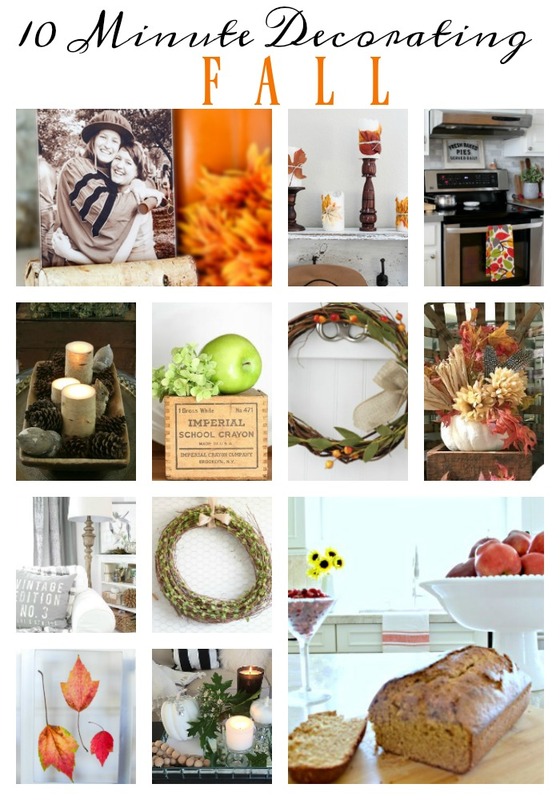 Love your centerpiece, but really trying to see photo of what you have in front of your fireplace! I was trying to come up with something last night to put in front of mine and would love to see that one up close. Is there a pic available? 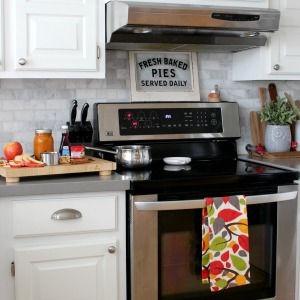 HI Angie – stay tuned for Monday for my Fall Home Tour! I’ll be showing lots of pics of my fireplace and mantel! So pretty Kelly, love it! 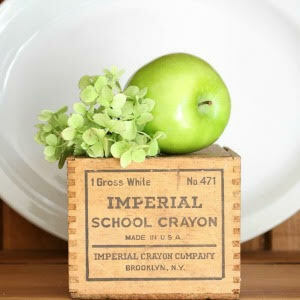 Love old dough bowls but up till now never found one I either fully liked or could afford. Yours looks great and I love the “critter” too! Thanks so much Karen – keep your eyes peed for that dough bowl! This is so pretty and I love the squirrel! 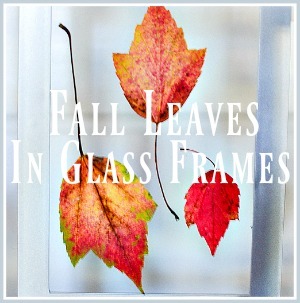 Thanks Kristin – hope fall has arrived in CA! Gorgeous! 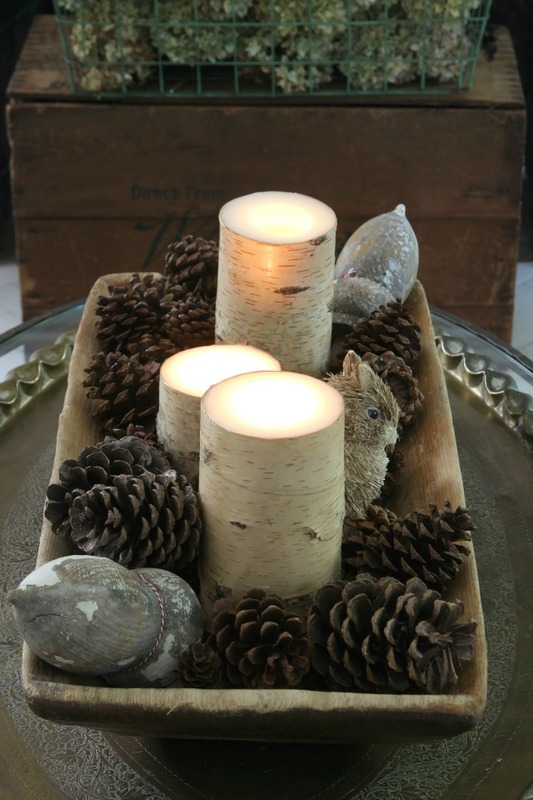 Love the birch candles and the little squirrel! 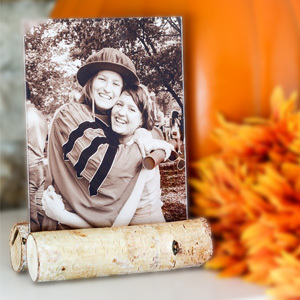 Thank you Heather – happy fall! 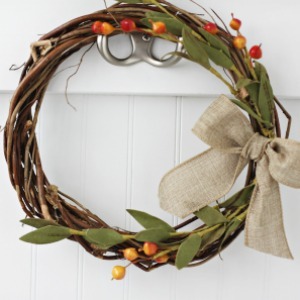 Love the dough bowl fall arrangement…..
I’m amazed by how simple and amazing it is. It looks great! I’m definitely doing it this week. Thank you for the post!